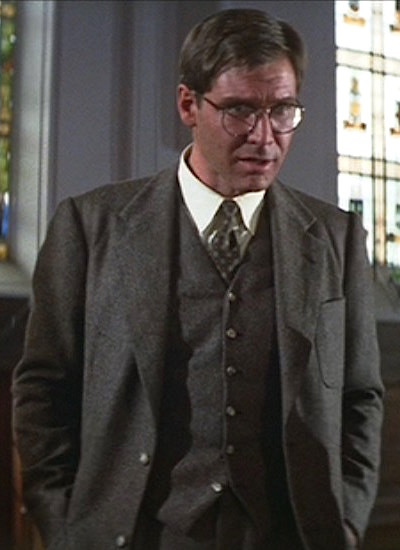 Following the exciting opening scene in Raiders of the Lost Ark, the film transitions from a South American jungle to the genteel setting of the fictional Marshall College in Connecticut where Dr. Jones is introduced as a highly popular instructor of the college’s Archaeology 101 course. After uncomfortably waiving off the eyelidded advances of some of his female students, our protagonist is visited by dean of students Marcus Brody (Denholm Elliott) and introduced to two visitors from U.S. Army Intelligence seeking his interpretation of an intercepted German cable concerning Indiana’s former teacher, Professor Abner Ravenwood. Discovering that the Nazis are close to discovering the legendary Ark of the Covenant, Indy packs his revolver and bullwhip and sets off to Nepal. 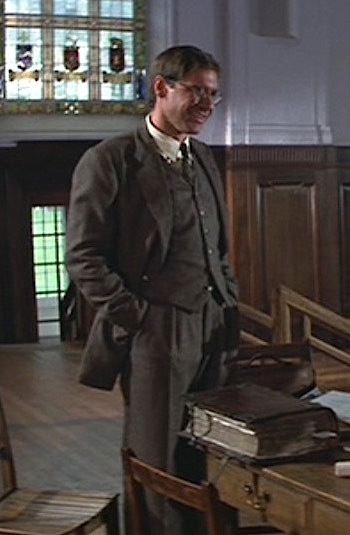 Tweed is something of a uniform for the Jones family of professors, as Indiana Jones wears a tweed jacket or suit in all four of the currently released films of the franchise and even his father, Professor Henry Jones (Sean Connery), sports a tweed three-piece suit through much of Indiana Jones and the Last Crusade. Indy’s first tweed suit is a brown barleycorn tweed three-piece suit worn for classroom instruction followed by an impromptu meeting with U.S. Army Intelligence. Magnoli Clothiers offers the “Marshall Suit” inspired by Dr. Jones’ suit in Raiders of the Lost Ark in a variety of colors offered in pure premium wool (for $935) or a twill wool blend (for a discounted $735) suitings. I have no firsthand experience with this suit, but it looks very stylish and screen-accurate with plenty of great feedback from wearers. The single-breasted suit jacket has notch lapels that roll to a two-button front. The jacket has natural shoulders with roped sleeveheads and three buttons at the end of each sleeve. The jacket’s sporty nature is conveyed with its three patch pockets – one on the left chest and one on each hip. The ventless back is very uniquely detailed in the spirit of the 1930s with a straight horizontal yoke across the top from shoulder to shoulder and a darted half-belt pulling in the waist. An inverted box pleat splits the center from yoke down to half-belt with two additional pleats on each side of the center box pleat to give Indy a wider range of motion as he reaches to write on his chalkboard. An inverted box pleat and half-belt were among the practices used by 1930s tailors to give wearers a greater range of motion in addition. “Bi-swing” shoulder pleats, though not found on Indiana Jones’ suit, are another element of ’30s tailoring used on some “action back” jackets. The suit has a matching single-breasted waistcoat (vest) with six brown urea buttons; Indy correctly leaves the lowest button undone on the vest’s notched bottom. There are four welted pockets. Indy’s cream cotton shirt coordinates with the earthy suit and Ford’s warm complexion without delivering the stark contrast of a pure white shirt. The shirt has a point collar, front placket, and rounded barrel cuffs that close with a single button. Professor Jones delivers some hot takes on the Neolithic era. Indy’s tie injects some muted color into his staid outfit with a pattern of spots on an olive green ground. The dots alternate between maroon with a beige center dot and beige with a maroon center dot. Magnoli Clothiers offers the “Marshall Tie” for $55 as a great accompaniment to the suit. The 100% silk tie is described as having a “woven pattern of cream and maroon circles on an olive background,” much like Harrison Ford’s screen-worn tie. The suit’s pleated trousers rise high enough to appropriately conceal the waistband under the vest. They have slanted side pockets, at least one jetted back pocket on the right side, and are finished with turn-ups (cuffs). Indy’s shoes appear to be brown leather oxfords. SunglassesID.com identified Indy’s glasses in Indiana Jones and the Temple of Doom and Indiana Jones and the Last Crusade as the Savile Row “Beaufort Panto” model with a 14-karat gold frame, “Chestnut” rims, and half-covered cable. His similarly described glasses in Raiders of the Lost Ark are likely the same model. Indy’s meeting with the U.S. Army Intelligence team sets the stage for his following adventures in Nepal and Egypt where he wears his iconic leather flight jacket, brown fedora, and bullwhip. You can learn more about this outfit from the experts at IndyGear.com as well as my post from July 2016. A stylish, well-cut tweed three-piece suit with unique sporty details is the perfect solution when dressing up for autumn, and Indiana Jones looks fashionably professorial when wearing his suit of choice to instruct his fall semester students. Didn’t any of you guys ever go to Sunday school? This introductory scene would later be echoed in the third film of the series, Indiana Jones and the Last Crusade, beginning with a close-up of Indy’s hand as he writes on the chalkboard for his students and panning out to reveal him again in a brownish tweed three-piece suit – this time a striped suit worn with a striped shirt and bow tie – before Marcus enters and ushers him away for an expository meeting that sets the central adventure in motion. Nice suit. Love the jacket’s styling. Not related with Dr Christmas Jones by any chance? Now that would be some interesting fanfic!